Alphabet books seem to be trending lately. That’s good news for all the young readers who can pick and select which alphabet book they connect to. In this review, I look into 2 alphabet books. 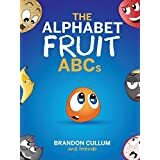 The Alphabet Fruit ABCs lists fruits starting from apple and banana which we all know and then going to some unknown exotic fruits, like nugu and the zigzag fruit which closes the cute funny book and made me run to Wikipedia to look up those guys. The computerized illustrations show a different personality for each fruit which is nice, and the text is a nice mixture of repetition and some rhymes that would make it easier for young kids to memorize. The theme of Zoo of emotions is somewhat similar to the fruits ABC since it also has a main theme. As the title hints, the theme is animals and emotions. Each letter is an animal starting from Antelope and ending with Yak and Zebra. But there is also another layer, which is the emotion attached to the animal. The emotions start with the same letter as the animal, for example, the Mouse is Moody and Manically Moving piles of Mud. The texts are delicate and well thought. The rhyming is superb. The water-colored illustrations are amazing. They are colorful and expressive, absolutely eye-catching.